"Europe becomes more and more a province of Islam, a colony of Islam." So declares Oriana Fallaci in her new book, La Forza della Ragione, or, "The Force of Reason." And the famed Italian journalist is right: Christianity's ancient stronghold of Europe is rapidly giving way to Islam. Two factors mainly contribute to this world-shaking development. The hollowing out of Christianity. Europe is increasingly a post-Christian society, one with a diminishing connection to its tradition and its historic values. The numbers of believing, observant Christians has collapsed in the past two generations to the point that some observers call it the "new dark continent." Already, analysts estimate Britain's mosques host more worshippers each week than does the Church of England. An anemic birth rate. Indigenous Europeans are dying out. Sustaining a population requires each woman on average to bear 2.1 children; in the European Union, the overall rate is one-third short, at 1.5 a woman, and falling. One study finds that, should current population trends continue and immigration cease, today's population of 375 million could decline to 275 million by 2075.To keep its working population even, the E.U. needs 1.6 million immigrants a year; to sustain the present workers-to-retirees ratio requires an astonishing 13.5 million immigrants annually. Into the void are coming Islam and Muslims. As Christianity falters, Islam is robust, assertive, and ambitious. As Europeans underreproduce at advanced ages, Muslims do so in large numbers while young. 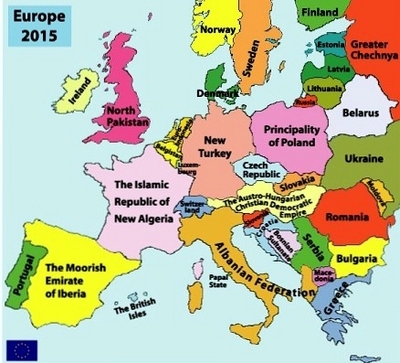 How some see the future of Europe. Some 5% of the E.U., or nearly 20 million persons, presently identify themselves as Muslims; should current trends continue, that number will reach 10% by 2020. If non-Muslims flee the new Islamic order, as seems likely, the continent could be majority-Muslim within decades. When that happens, grand cathedrals will appear as vestiges of a prior civilization — at least until a Saudi style regime transforms them into mosques or a Taliban-like regime blows them up. The great national cultures — Italian, French, English, and others — will likely wither, replaced by a new transnational Muslim identity that merges North African, Turkish, subcontinental, and other elements. This prediction is hardly new. In 1968, the British politician Enoch Powell gave his famed "rivers of blood" speech in which he warned that in allowing excessive immigration, the United Kingdom was "heaping up its own funeral pyre." (Those words stalled a hitherto promising career.) In 1973, the French writer Jean Raspail published Camp of the Saints, a novel that portrays Europe falling to massive, uncontrolled immigration from the Indian subcontinent. The peaceable transformation of a region from one major civilization to another, now under way, has no precedent in human history, making it easy to ignore such voices. Changes in Europe that lead to a resurgence of Christian faith, an increase in childbearing, or the cultural assimilation of immigrants; such developments can theoretically occur but what would cause them is hard to imagine. Muslim modernization. For reasons no one has quite figured out (education of women? abortion on demand? adults too self-absorbed to have children? ), modernity leads to a drastic reduction in the birth rate. Also, were the Muslim world to modernize, the attraction of moving to Europe would diminish. Immigration from other sources. Latin Americans, being Christian, would more or less permit Europe to keep its historic identity. Hindus and Chinese would increase the diversity of cultures, making it less likely that Islam would dominate. Current trends suggest Islamization will happen, for Europeans seem to find it too strenuous to have children, stop illegal immigration, or even diversify their sources of immigrants. Instead, they prefer to settle unhappily into civilizational senility. Europe has simultaneously reached unprecedented heights of prosperity and peacefulness and shown a unique inability to sustain itself. One demographer, Wolfgang Lutz, notes, "Negative momentum has not been experienced on so large a scale in world history." Is it inevitable that the most brilliantly successful society also will be the first in danger of collapse due to a lack of cultural confidence and offspring? Ironically, creating a hugely desirable place to live would seem also to be a recipe for suicide. The human comedy continues. Aug. 8, 2009 update: In a highly unusual occurrence, a major European newspaper has written about this demographic issue, even using the same title as I do above: London's Daily Telegraph today published "Muslim Europe: the demographic time bomb transforming our continent. The EU is facing an era of vast social change, reports Adrian Michaels, and few politicians are taking notice." Could this be the start of a change? I doubt it.